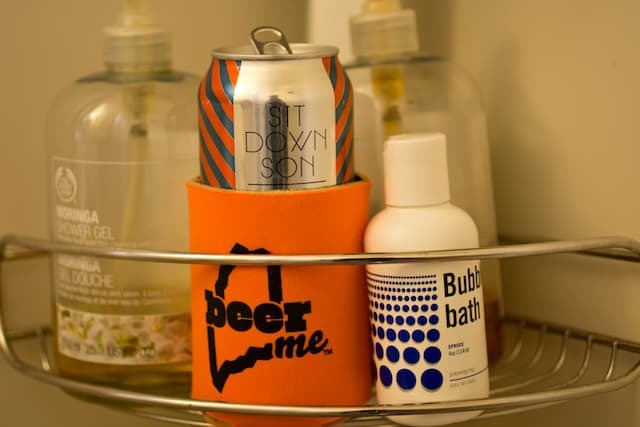 The Pleasures of Shower Beer and Shower Coffee | Good. Food. Stories. If you’re one of those people who talks about living in an old house in terms of its “character,” you’re also one of those people who accepts a certain level of upkeep and repair to go along with all of that century-old charm. And unless you come in with a plan for a gut reno, you’re going to live with some of those charming quirks for a while. One of the things you’d probably never see in a new house is a window that juts into the bath/shower, as we have in our rad ’80s-styled flowery bathroom. But it’s the part of the room’s layout I appreciate most: for one, the windowpane is stained glass, which will remain even if we ever get around to upgrading our dusty mauve floral tiles and super awesome pink tub and toilet. Perhaps more importantly, the windowsill doubles as a shelf for my morning shower coffee and afternoon shower beer. 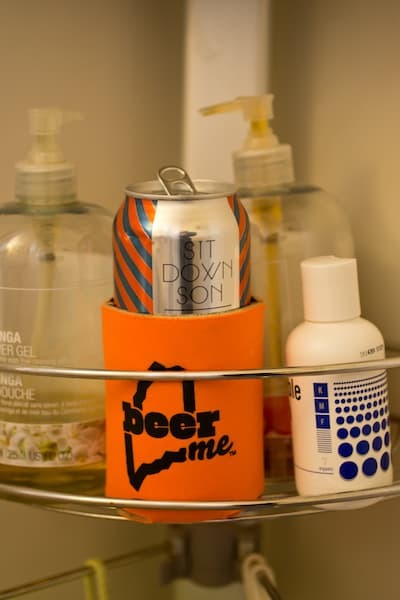 In the dorms, there was always the added frisson of rule-breaking; a can of beer tucked into the pocket of your robe or in your shower caddy always tasted a little more exhilarating. As a responsible adult, the shower beer now seems to most often find its place as a vacation treat or post-yard work reward. Where it used to signify the promise of adventures yet to come and unfettered freedom, it’s now a capper on an afternoon well spent and a metaphorical clink of the glass to the fringe benefits of adulthood. We may be getting older, but our taste in beer is better. On a hot July afternoon, the warm water dripping off my hand mingles with the chilled condensation on the can. The scent of sunny summer air breezes through my open bathroom window, at once invigorating and nostalgic. The rustle of trees and the air on my skin reminds me of my cabin at Interlochen and of naps on the beach at Lake Winnipesaukee; the beer in hand lets me shift mental gears from the day’s exertions to an evening of relaxation on the porch or around the fire pit. For me, shower beer is a different state of mind than bathtub wine. An evening bath is a relaxing indulgence to begin with, and the act of slowly sipping wine brings you into a more meditative state than the mind-clearing, blow-off-steam nature of a shower beer. I mean, you gotta take a shower every day anyway (at least I do); having a beer on the sill turns a mundane activity into a you-earned-it moment. The shower coffee, on the other hand, cross-pollinates. It simultaneously gives you a burst of motivation while slowly easing you into your day. 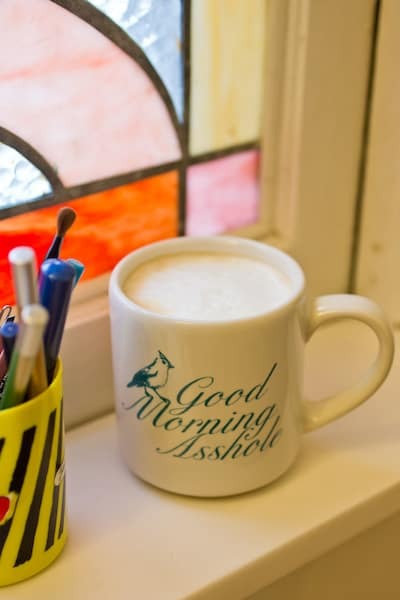 On winter mornings, as my house’s radiators start to hiss and creak like they’re popping their joints, I set my coffee on the windowsill. It’s still dark on the other side of the stained glass. I crank the bathroom heater and run the hot water until it’s a little too painful. The mirror starts to fog and the tiny room is filled with wisps of steam and I stand under the spray, drinking coffee and soaking up a one-two punch of warmth. Shower beer, shower coffee. Two sides of the same coin. Two ways to give yourself an attaboy for making it through the day. And two very good reasons to somehow get yourself a shelf in your shower.